Silvan Australia employs a process of continuous product improvement and development which takes into account the experiences and requirements of its clients. Silvan Machinery has completed an enhancement project to its popular Three Point Linkage sprayer range, which is widely used by dairy farmers, pasture producers, hobby farmers, vegetable and horticultural growers. 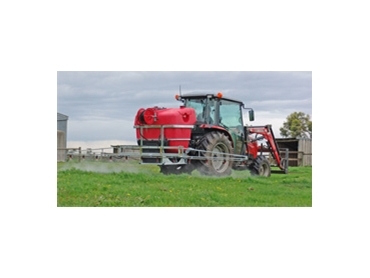 The new improvements on the agricultural sprayers relate to the popular 400, 600 and 800 litre Pasturepak Series, and 1000 litre Slimline linkage sprayers. An optional 70 litre capacity freshwater flush tank that is moulded to fit between the main spray tank and its galvanised steel structural frame now features on the 800 and 1000 litre models. With its 70 litre capacity and convenience, users can safely flush the spray tank, filter, boom and spray nozzles ready for the next application. Additionally, the boom frame has been redesigned on the complete range to utilise a vertical steel boom channel which employs four fixing bolts to enable the boom to be adjusted and positioned to the ideal heights for crops or pastures and to reflect their various growth stages. David Carr, Silvan spraying specialist says that feedback from growers has indicated that they wanted to be readily able to adjust the height of the spray boom to suit their individual field conditions. “Silvan is able to offer a wide choice of galvanised steel booms where the boom height above the pasture or crop level can now be adjusted to the desired height by sliding the boom up or down the new mounting channel and then securing it in the desired position by a four bolt connector. “Silvan has a wide range of boom choices up to fifteen metres in width to suit virtually any field or paddock application. “In fact we can offer the choice of our popular Devil booms, Fieldmaster, Rowmaster, Olive and Vine Booms or the Oscillating Casotti Sprayer which is ideal for many awkward or hard to reach places where a boom would be unsuitable. There is the alternative Boomless Nozzle Kit that can spray over 10 metres wide and sits neatly between the upright bars on the Linkage units. The traditional features of the Silvan Three Point linkage sprayer range have also been retained. The impact resistant low profile Polytuff polyethylene spray tank carried within the sturdy hot dip galvanized frame with an improved adjustable hitch system to suit a wide range of tractor mounting points. To enable the ideal alignment of the PTO shaft from the sprayer to the tractor the pump mounting height has been raised. The Silvan TPL sprayers have a choice of high quality, high performance diaphragm pumps offering capacities from 58 to 121 litres per minute. A range of options including electric control valves, foam markers and hose reels with pressure hose and spray gun for spot spraying applications are available. “Silvan can rightly claim that its Three Point Linkage sprayer range offers unique choices of options and product features to suit any field or crop spraying need” David Carr added.